I saw a variety of do-it-yourself CAT and Data interfaces online and each had its good points, but I couldn't find one that was exactly what I wanted. So I took the best parts of a couple of designs and combined them into one. I also altered a few part values mostly to use stuff I already had on-hand. A case from an old VGA video switch was repurposed as the interface enclosure. I already had a small 4-port USB hub and I picked up a USB sound card and Serial-to-TTL level converter online for a few bucks each. I built the rest of the circuit on prototyping board. The drivers for the hub, sound card and USB serial adapter install automatically in Windows 10. 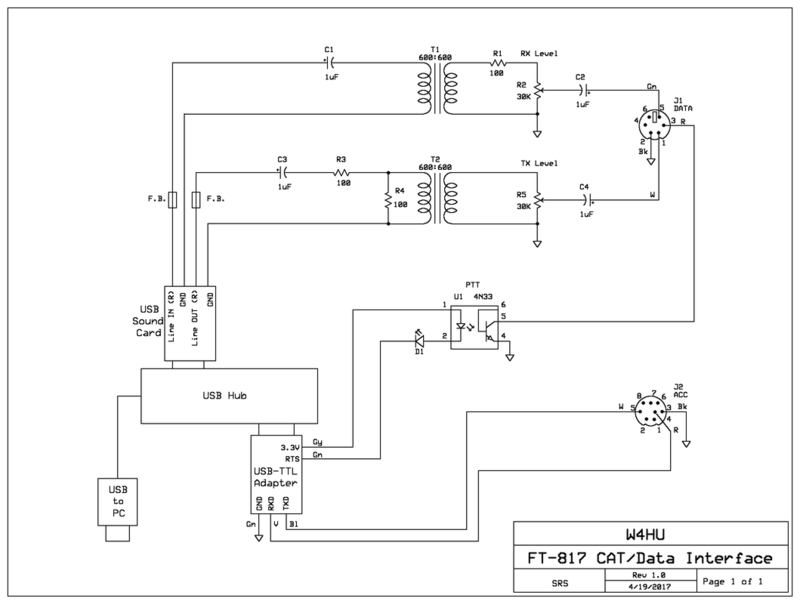 This serial adapter uses the CH340 chipset driver. 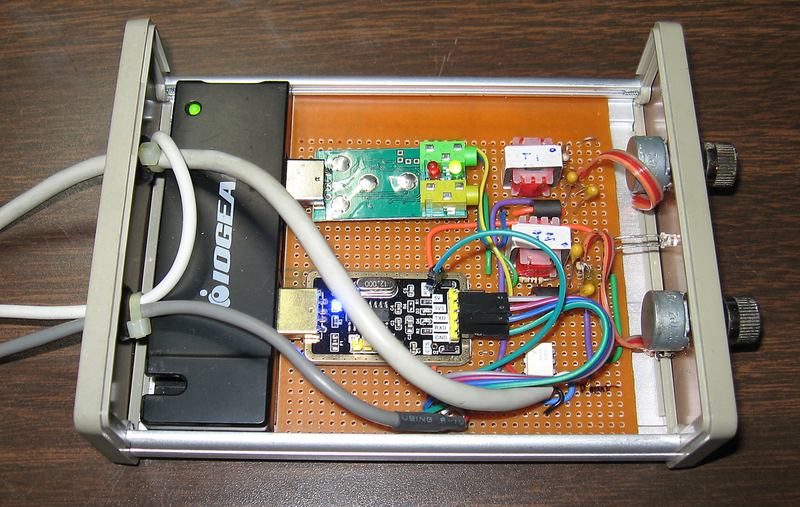 4-port USB hub, USB sound card and RS-232 converter as the basis of the adapter. I added audio line isolation transformers and front panel level controls. The hardware PTT uses a 4N33 opto-isolator chip and there is also a front panel PTT LED indicator. I changed a couple of resistor values from the online schematics because they attenuated my audio line levels too much. The arrangement of components inside the case. The USB devices just plug into the hub. I left the case on the hub because it happened to snugly slide between the sides of the metal case. But I did open the hub and replace the original short USB cable with a longer one. The case was removed from the sound card to make it fit and ribbon cable was soldered to the microphone and audio connections instead of using the jacks, just to save space. 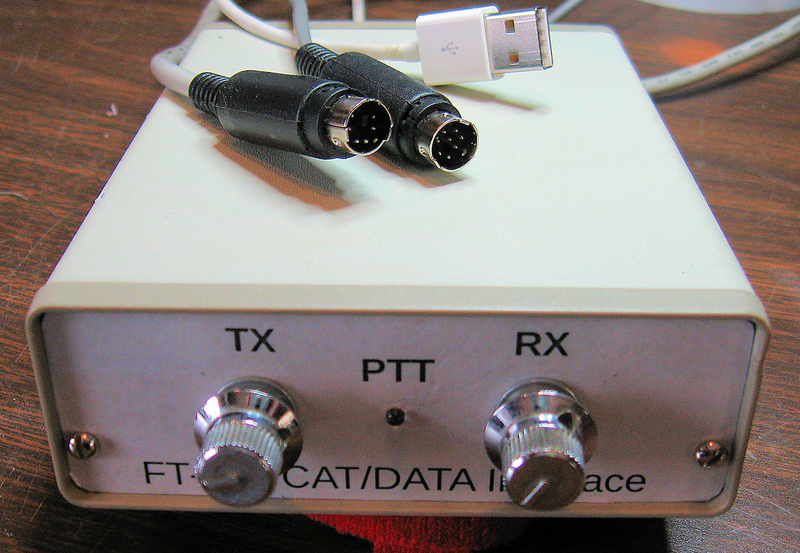 The serial-to-TTL converter was not in a case. But it did come with ribbon cable push-on connectors which were used to connect it to the prototype board. I made new panel inserts for the case from pieces of copper sheet left over from another project. The label in the first photo was created in Libre Draw and simply printed on a laser printer, covered with clear packing tape, and glued to the panel.